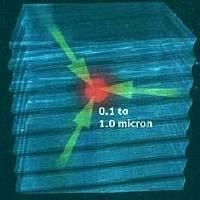 Bubble expands from 5 to 50 microns. Step 2. Near-vacuum bubble with high pressure outside. 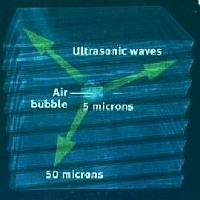 Higher pressure compresses bubble down to 0.1 microns. Step 4. Spherical implosion occurs in liquid media. The Alfa-Technology uses spherical implosions of near vacuum micro bubbles, which generated and collapsed with Sonoluminescence (SL) light inside stream of processing liquid media. The collapsed with spherical implosion micro bubbles generate an imploding shockwave with pressure up to 1000 MPa that compresses and heats the gas at the center of the bubble at least 10,000 degrees C and higher. 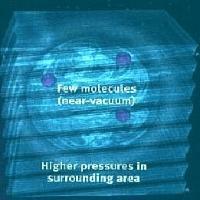 The atoms and molecules being to ionized or break down, forming plasma. The hot gas emits light through a torrential cascade of energy thereby creating SL light pulses. Combination of several physical effects: imploding shock-wave, SL light resonance and high temperature pulses has significantly influenced the processed fluid media and activates the main chemical reactions inside the Bubble Implosion Reactor. 7. treatment of water for activation of plants growth with more crop capacity.